Wealth inequality: Is it worse than we thought? The Shocking Rise of Wealth Inequality: Is it Worse Than We Thought? Turns out, these guys didn’t know the half of it. America’s gap between the rich and the rest might be worse than we ever knew. Economists Emmanuel Saez, of the University of California–Berkeley, and Gabriel Zucman, of the London School of Economics, are out with a new set of findings on American wealth inequality, and their numbers are startling. Wealth, for reference, is the value of what you own—assets like housing, stocks, and bonds, minus your debts. And while it certainly comes up from time to time, it has tended to play second fiddle to income in conversations about America’s widening class divide. In part, that’s because it’s a trickier conversation subject. 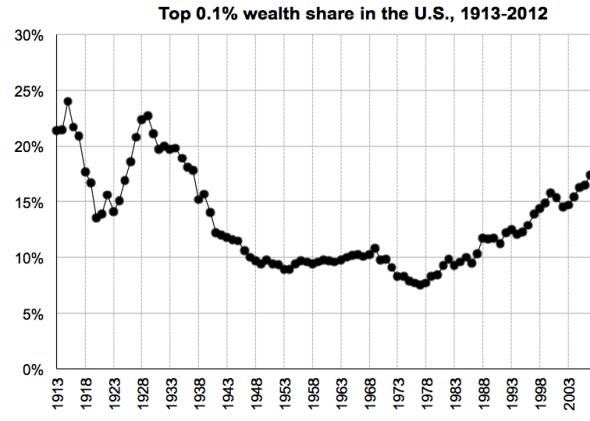 Wealth has always been far more concentrated than income in the United States. Plus, research suggested that the top 1 percent of households had actually lost some of its share since the 1980s. That might not really have been the case. Forget the 1 percent. The winners of this race, according to Zucman and Saez, have been the 0.1 percent. Since the 1960s, the richest one-thousandth of U.S. households, with a minimum net worth today above $20 million, have more than doubled their share of U.S. wealth, from around 10 percent to more than 20 percent. Take a moment to process that. One-thousandth of the country owns one-fifth of the wealth. By comparison, the entire top 1 percent of households takes in about 22 percent of U.S. income, counting capital gains. While the super-rich have risen, the merely affluent have barely budged. 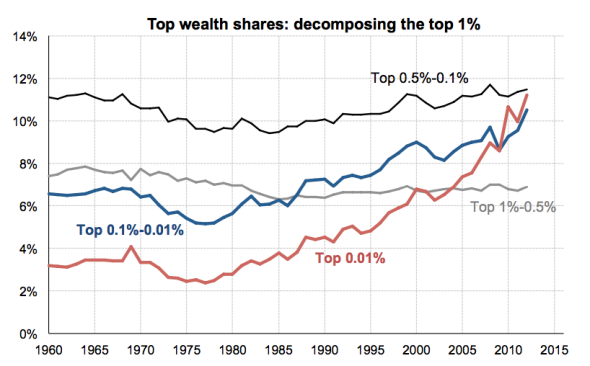 As shown on this next graph from Saez and Zucman, the share of wealth belonging to the top 1 to 0.5 percent of households has remained about level. The 0.5 to 0.1 percent have tacked roughly an extra percentage point onto their piece of the pie. The relative gains have been eaten up by the elite—the 0.1 percent and even the 0.01 percent. This new batch of research is similar in spirit to Saez’s pioneering work quantifying income inequality, which he has published with French economist Thomas Piketty. (It’s probably no accident that this research is coming out around the same time that Piketty, Saez’s longtime collaborator, has published Capital in the Twenty-First Century, his highly touted book about capital accumulation—aka wealth.) Both projects substitute tax data analysis for older approaches that relied on government surveys, which tend to undercount the very rich. In this case, Saez and Zucman use taxes on investment income to reverse-engineer their wealth estimates. The results are still very preliminary and could change with further study. But they are basically in keeping with what has already been shown about income inequality. 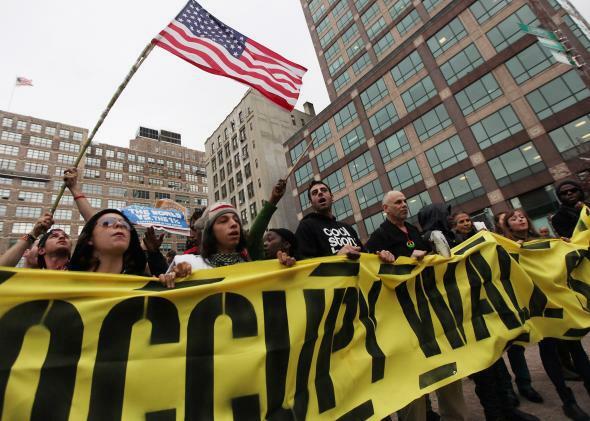 Occupy Wall Street trained Americans to frame the economic gap in terms of the 99 percent and 1 percent. But writers and economists have been pointing out for years that the biggest winners in today’s globalized, finance-heavy economy have been an even smaller band of super-rich. Tim Noah dubbed them “the stinking rich.” Chrystia Freeland went with “plutocrats.” No matter what you choose to name them, the largest economic gains have accrued to Americans at the very, very tiniest tip of the earnings pyramid. Here’s one dramatic illustration I’ve drawn from the World Top Incomes Database. The top 0.5 percent, with minimum household income of $551,000, have roughly tripled their share of the nation’s paycheck since 1978, to about 18 percent. The bottom half of the 1 percent, the work-a-day rich, have upped theirs only to around 4 percent. Turning income into wealth takes saving and investment. And over the years, wealth compounds. That’s why wealth inequality is always more severe than the income gap: The well-to-do can save relatively more to start, and then their advantage builds on itself. It may also explain why the super-rich are sprinting ahead while the ordinary affluent are more or less standing in place. The economy has treated small-business owners, corporate lawyers, and doctors well. But in order to keep up their lifestyles, they may need to spend relatively more of their income than, say, a Fortune 500 CEO or hedge funder. And so an exceptionally tiny circle of Americans is not only commanding a greater and greater share of pay, but—if Saez and Zucman are right—they are successfully consolidating their fortunes far faster than 99.9 percent of the country. At the risk of sounding a little melodramatic, this is how an aristocracy gets built.